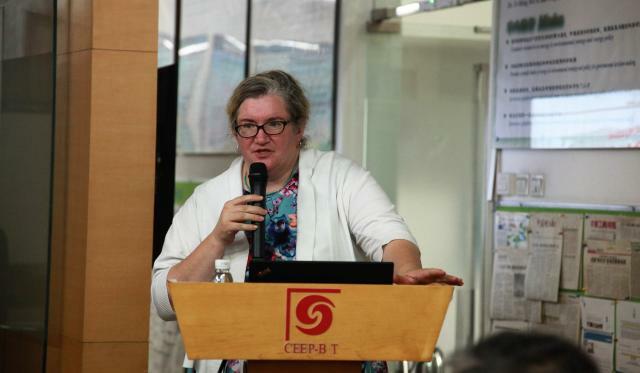 At 14:30 on September 13, 2018, Prof. D’Maris Coffman of Bartlett School of Construction and Project Management, university college London, was invited to visit CEEP and do an academic report entitled “Can the sharing economy help combat climate change and promote sustainable societies?”. 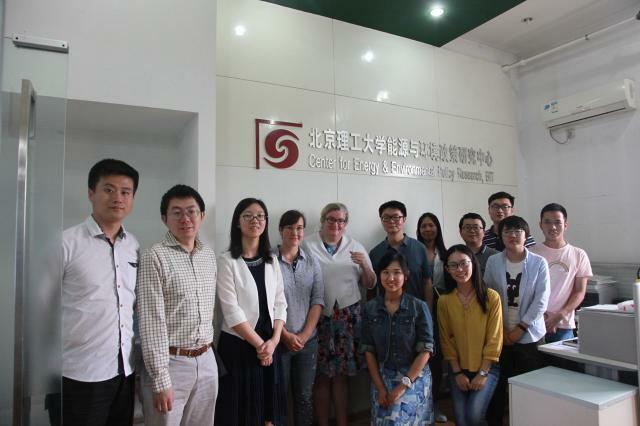 This report was hosted by Prof. Biying Yu, many teachers and students attended the report. Dr. D’Maris Coffman joined UCL in September 2014 as a Senior Lecturer in Economics and Finance of the Built Environment at CPM here at UCL Bartlett. In February 2017, she was appointed Interim Director (Head of Department) of BSCPM. In late January 2018, she was appointed to a professorial chair in Economics and Finance of the Built Environment with effect from March 2018. Before coming to UCL, she spent six years as a fellow of Newnham College where I variously held a junior research fellowship (Mary Bateson Research Fellowship), a post as a college lecturer and teaching fellow, and a Leverhulme ECF. In July 2009, she started the Centre for Financial History, which she directed through December 2014. It is still going strong, but has moved from Newnham College to Darwin College in line with the affiliation of its new director. She did her undergraduate training at the Wharton School in managerial and financial economics and her PhD in the School of Arts & Sciences at the University of Pennsylvania. While at Penn, her doctoral research in the UK was funded in part by the Mellon Foundation under the guise of an IHR pre-doctoral fellowship and an SSRC international dissertation fellowship. Professor Coffman’s research interests span infrastructure, construction, real estate and climate change. In today's report, professor Coffman introduced sharing economy and if sharing economy help combat climate change and promote sustainable societies. First, she introduced the background of this study. The greatest barrier to achieving the UN Global Goals programme is the need for simultaneous improvement of both ecological and economic efficiency. Too often policymakers see these as conflicting priorities, which makes it impossible to accomplish the scale of economic and social change required. She and Dr Zhifu Mi argue that the sharing economy offers the potential to promote the needed shifts in collective consumption behaviour that will deliver both economic efficiency and greener growth. But the sharing economy is not intrinsically sustainable and there is considerable debate how far specific solutions (bike sharing, car sharing, flat-sharing) actually deliver reduced carbon emissions or greener growth or public health benefits in their current forms. New research is desperately needed. Most advocates of the sharing economy are entrepreneurial start-ups that embrace the rhetoric of ‘disrupting the old economy’ in order to unlock cheaper options for consumer behaviour. These new business models offer both opportunities and challenges for governments, which will require a renewed commitment on the part of public authorities. They conclude that states can effectively regulate, incentivise and protect promising enterprises that pass a Life Cycle Assessment test aligned with principles of Corporate Social Responsibility. They argue this is the best way to harness the sharing economy for a variety of pro-social goals. After the report, professor Coffman took the picture with teachers and students at CEEP together.